In 1938, Horace Pippin described how he painted pictures: “The pictures I have already painted come to me in my mind, and if to me it is a worth while [sic] picture I paint it. 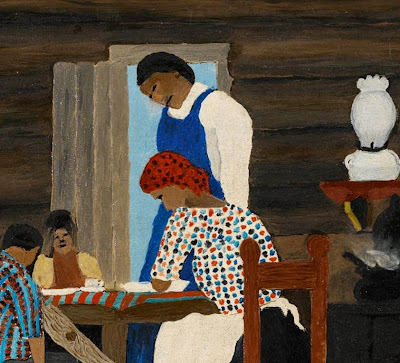 I go over the picture several times in my mind and when I am ready to paint it I have all the details I need.” (from “Horace Pippin,” in Holger Cahill et. al., Masters of Popular Painting: Modern Primitives of Europe and America, MoMA, p. 125). 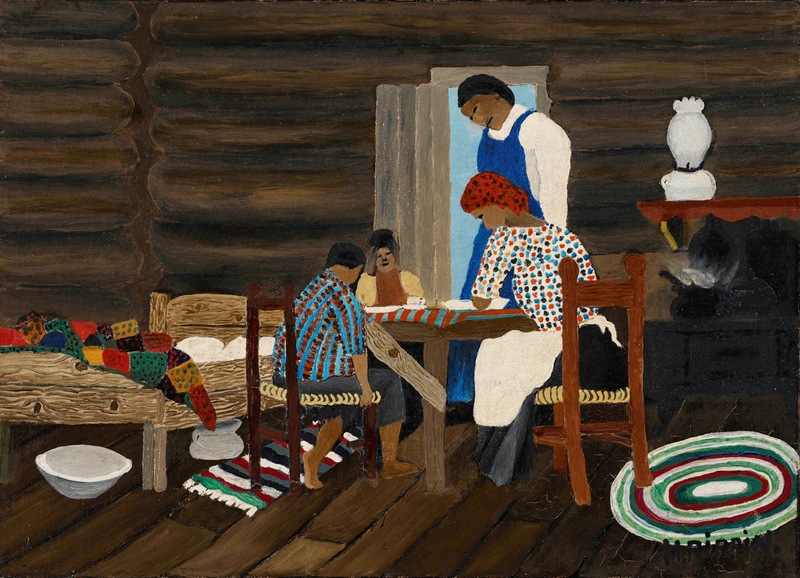 The current exhibit, “Horace Pippin: The Way I See It,” at the Brandywine River Museum of Art, presents 65 of his paintings, the first major retrospective of his work in 20 years. One of those paintings, West Chester, Pennsylvania, I wrote about in Making the Invisible Visible: Part II. The story goes like this: A young Ed Loper, a high school graduate with no art background, trained by the Works Progress Administration to produce exact watercolor reproductions of early American antiques, went off one day to watch Horace Pippin work on a painting in West Chester, PA. 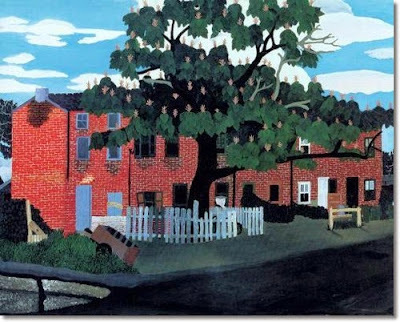 He stood behind Pippin and looked at his picture and at the scene Pippin was using as a subject, a block of row houses near South Adams Street in West Chester. Pippin explained his process to other people as well, thus the title of the current exhibit. An artist confronts a subject and feels interested in it. 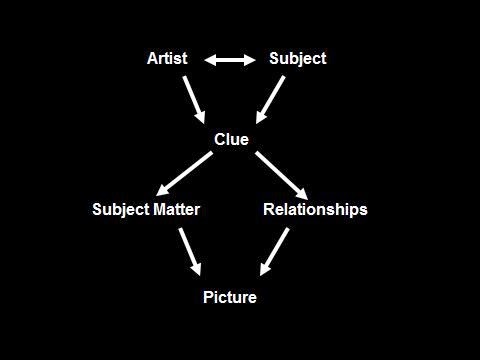 The subject acts on him like a catalyst acts on a chemical reaction: it triggers an insight, the clue. This is what Pippin meant when he said the picture came to him in his mind. Pippin may not have needed the subject directly before him as in West Chester, Pennsylvania. His painting may have originated in an experience in WWI, in something he read, in church, in the Bible, in a room, anywhere or anything at all. But what he saw in his head established the clue he needed to make a painting. That clue was a new thing: a picture idea. Then he could go to work inventing the relationships of color, line, light, space, mass, and pattern to record on a flat surface what he saw in his mind. 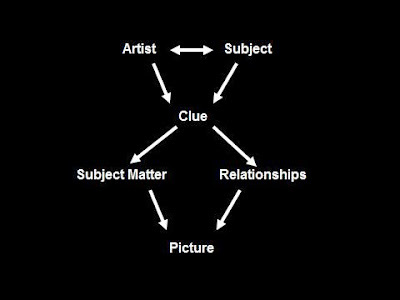 When I said in a previous post an artist, at that first interested look, no longer “sees” his subject as it “is,” as we would see it, some of you did not understand how this could be so. If you re-read What Dreams May Come, you will get a detailed description of what I call informed perception and also my analysis of West Chester, Pennsylvania. 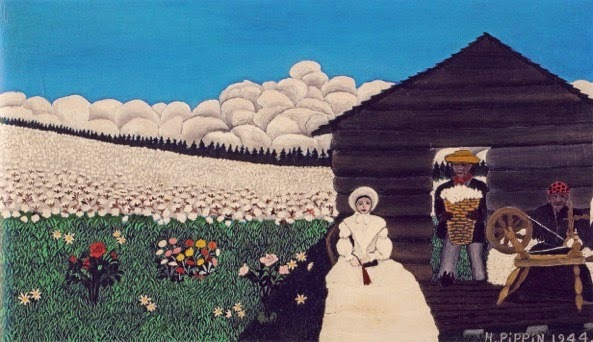 If you don’t feel motivated to visit the current Pippin exhibit, please consider doing so if only to see this painting. Digital images never do justice to originals, but West Chester, Pennsylvania, which I had never seen before except in printed or digital format, captivated me with its size (29 3/8 x 36 3/8 in. ), richness of color, and dramatic light/dark rhythms. His paintings answer this question. 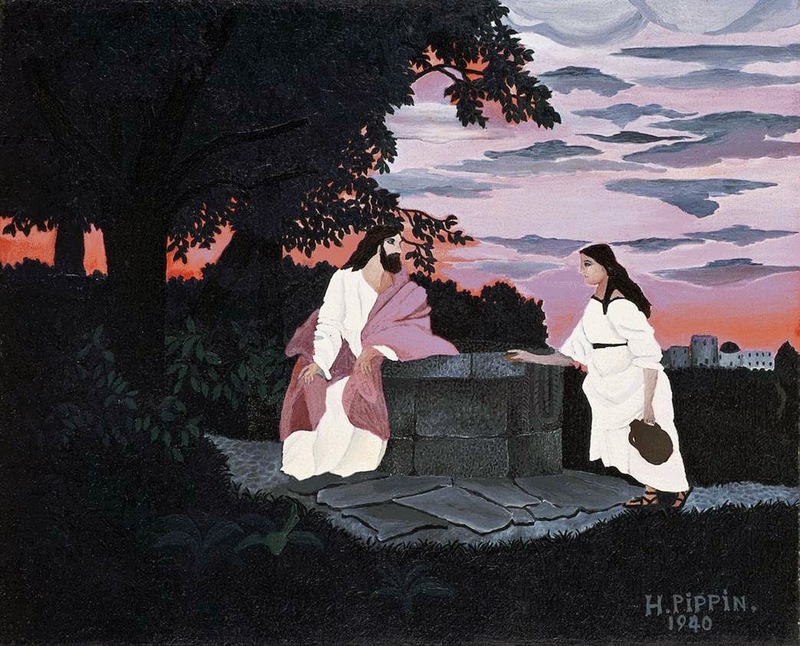 Violette de Mazia said his Christ and the Woman of Samaria has an intensity of color drama, a stark vividness, a clarity of space, a sense of naïveté.” (“What to Look for in Art,” The Barnes Foundation Journal of the Art Department, Autumn, 1970, Vol. I, No. 2, p. 21. Inverted, a series of bright, vivid, flattened vertical and gently curved color shapes dramatically contrast with dark, heavy, horizontal bands. The stark white of the man’s shirt, the woman’s apron, the pillows on the bed, the lamp, the ovals in the floor mat (now on the upper left), the stripes in the rectilinear mat (now on the upper right), the rim of the bowl, and the cups and saucers on the table move the eye in-and-out through the picture. Upside down, it is easier to see the series of arcs, semi-circles, and rippling units contrasted with the rigidity of the floorboards, shutters, chair legs, and bedposts. 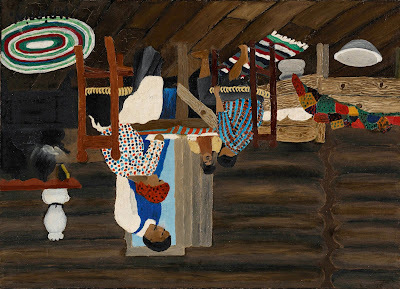 The units of figures at the table and the quilt draped over the bed reveal the constricted space each color unit occupies. 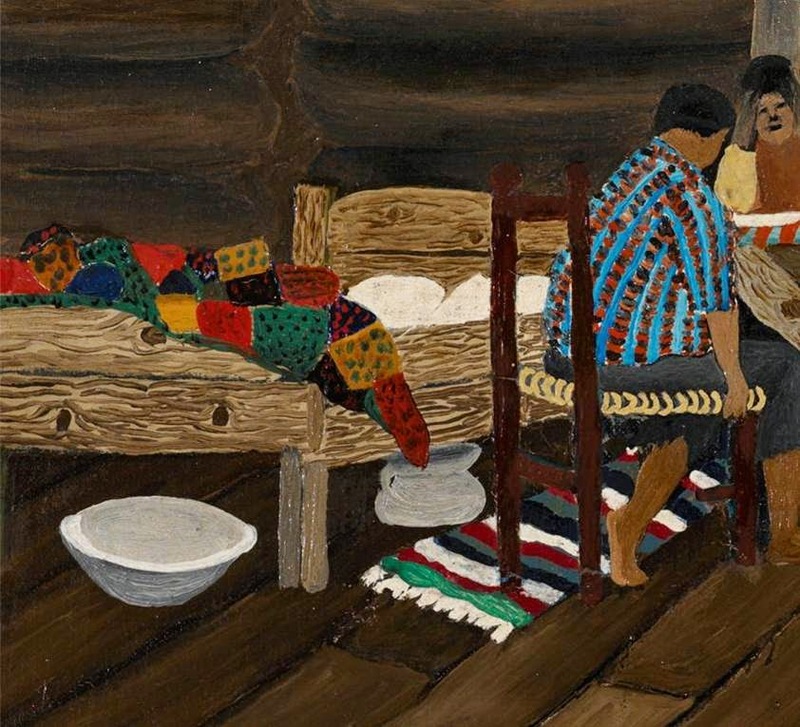 Color patterns of stripes, dots, and bands establish rhythms of blue-white-tan-black in the man that become red, cerulean, and black rows of linear dots on the woman’s blouse and gray-black dots on her red headscarf. The boy’s cerulean shirt reverses this with stripes of black dots on red. The girl’s hair and face is a series of dark-brown and tan while her ochre arms bookend a warm-brown napkin. The tablecloth continues the series of horizontal and vertical cool-blue and orange-red arcs and stripes. The left side of the picture rhythmically varies the theme of arcs, bands, and dots while, at the same time, introducing a color note of emerald green. Notice the in-and-out movement under the bed and the chair. Notice the stark brightness of the white fringe and the white diagonal stripes on the floor mat. Notice the “surprise” of the addition of the green stripe to the white, black, gray, and red ones. Notice the space created by the boy’s leg, the legs of the chair, and the bowl under the bed. Notice the “spaghetti-like” strands of darker tan patterning the light ochre of the bed frame. Notice the repeated, golden arcs of the “edge of wicker” chair continuing the dark-light theme. Notice how all of this is off-set by the vertically rising, dark-brown floor boards and the brown-black horizontal bulging wall logs. 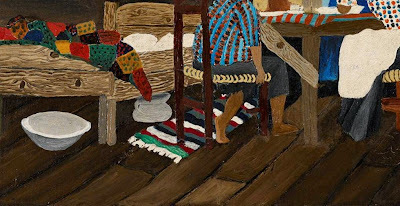 By including some more color units to the right, you can see the rhythmic connections between the patchwork of the comforter, with its rectilinear color units and reversals of dark green on light gold, dark gray-black on red, and bright red on black, with the units in the floor mat, the boy’s shirt, and the woman’s blouse. You can also see more easily how the white units move in-and-out in space. The pictures come to his mind. He sees what he sees, and then he makes his picture. We, when we appreciate his pictures, learn to enjoy aspects of our real world. 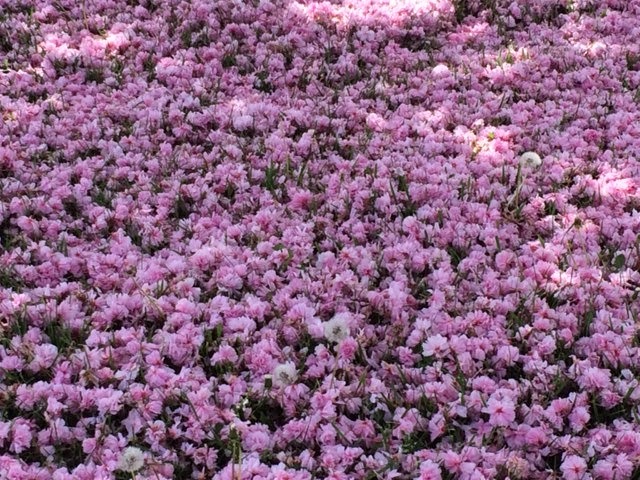 For example, today I took a walk through a nearby park, and I noticed that three Kwanzan flowering cherry trees had dropped most of their flowers, blanketing the ground under them. 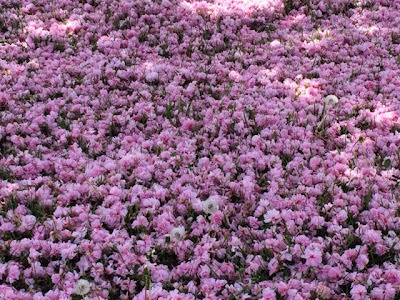 I examined the soft puffs of pink, delighted in the richness of the color, and enjoyed the dark green shoots creating crevices and projections in the shallow spaces between each flower.